Prin. 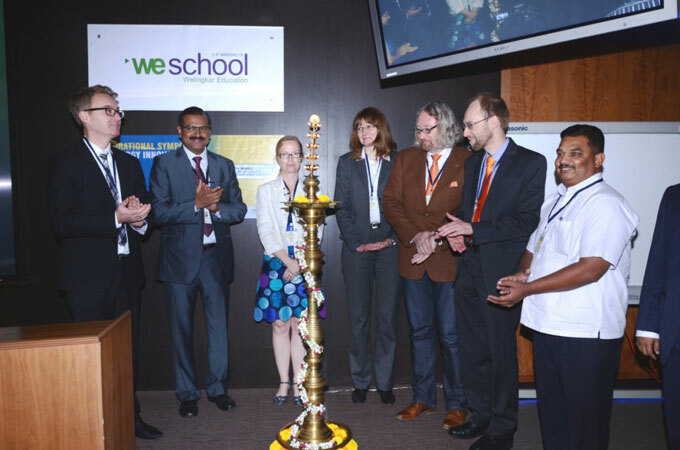 L. N. Welingkar Institute of Management Development & Research (WeSchool) hosted the Inspirational Symposium on Energy Innovations on April 04, 2014 at WeSchool campus in Mumbai. WeSchool is the academic partner for the initiative along with Mälardalen University, Sweden. WeSchool has been working with the university for the past 7 years and has signed a MoU to encourage collaborative learning and research. The symposium is part of the India-Sweden Innovations´ Accelerator (ISIA) supported by Swedish Energy Agency which is a bilateral program that contributes to facilitating technology transfer and market entrance in India for Swedish innovative companies, focusing on scaling and adapting their technologies to the local context. This initiative is supported by Business Sweden, Confederation of Indian Industries (CII) – Green Business Centre, Ministry of New and Renewable Energy as well as Bureau of Energy Efficiency (Govt of India). India and Sweden share a common objective of the need for innovation, to build domestic competitiveness, as well as to respond to the needs of growing demands in an energy-constrained world. The keynote address was delivered by Ms Fredrika Ornbrant, Consul General, Consulate General of Sweden followed by Mr Srikant Illuri, Executive Director, Business Sweden who outlined the various challenges facing the world due to excessive energy consumption. They focused on the need for shift in global thinking as well as technology that will drive change. With Sweden having the largest per capita consumption of energy, it has successfully reduced carbon emission and its green house effect has also gone down by 20% while the economy has grown by 60%. The relationship between India and Sweden has been driven by economic interest with bilateral trade accounting to over US$2.8 billion in 2011-2012. Environmental technology is one of the many areas recognized for cooperation. This symposium is the beginning of a new journey for a successful Indo-Swedish collaboration for energy innovation. The discussion at the symposium revolved around the possibilities and challenges involved in developing renewable energy systems and clean technology for India. This initiative will create a platform for innovative Swedish companies to connect with their respective Indian counterparts to explore the possibility of creating sustainable energy systems suitable for Indian market. This will also be an opportunity for strengthening the bi-lateral trade relationship between India and Sweden by bringing innovative solutions from Swedish companies to the Indian market and taking Indian grass root solutions to the Swedish market. “Also, this will be a great chance for WeSchool students to gain practical experience by working with Swedish companies and helping them develop real-life business models and marketing strategies suitable for the Indian subcontinent” he added. Established in 1977, Prin. L. N. Welingkar Institute of Management Development & Research (WeSchool) features among the premier Business Schools in India. Run by charitable Trust S.P. Mandali, Pune, all across the state of Maharashtra, WeSchool is ranked 15th out of 150 institutes in India as per the Annual Times B-School 2014 survey. It has also been ranked as 7th best institute in the West zone. WeSchool is among the top 10 institutes recognized for providing exposure to latest developments in the corporate sector & management practices, quality of internships and emphasis laid on personality development. WeSchool’s goal is to use the power of the amalgamation of design and management thinking and truly redesign the way education can make a meaningful difference to students, corporates and society that is visible through actions and outcome.